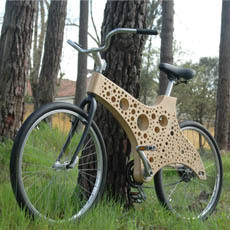 The name Xylon sounds like something futuristic and high-tech, the complete opposite of wood bicycle frames, but it actually comes from the Greek word for wood. Even still, there’s nothing traditional about Xylon Bikes with unique frames with clean modern designs that combine natural and geometric shapes to provide perfect balance along with original style. Each model is designed to be lightweight, yet strong and to exhibit its own unique character.